Which badges have I earned? There is Scouting in all but six of the world’s 216 countries and territories. 11 of the 12 people to walk on the moon were once Scouts. The number of Scouting volunteers in the UK is more than the workforces of the BBC and McDonalds combined. 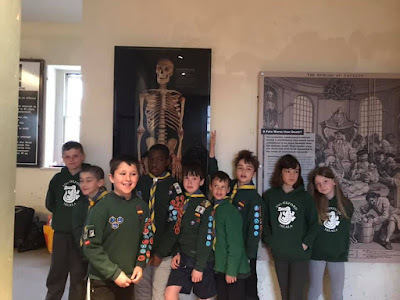 Nine of our Cubs had a spooky night sleeping in Oxford Castle! Lewis, Edwin, Daniel, Barnaby, Megan, Emily, Joe L, Joe C and Stanley were joined by around 40 other Cubs from all over Oxford for a very exciting evening. Once they'd made up their beds, they learnt all there is to know about castle history. We then hiked up Hangman's Hill and enjoyed the views over Oxford, went up the tower, explored the cells, and ended up in the crypt. A huge thank you to Ian from Wheatley for organising the event - we're looking forward to next year! © Rebecca Thomas: designed and maintained by Akela - if you have any comments or questions about the site please contact us.